We are delighted at West Eaton to have teamed up with Angie from Hereford Growing Point for gardening therapy. 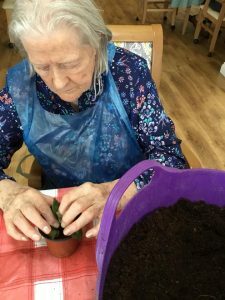 There are many therapeutic benefits of gardening and our residents are enjoying wonderful sessions with Angie. Gardening is mentally and physically beneficial. Planting containers and troughs at accessible waist level helps with movement and strengthens muscles. Planting seeds helps manual dexterity. Also the repetition of planting seeds in rows and in order can be relaxing for an anxious mind. The feeling of getting hands dirty in the soil, the smell and texture of the earth, can all trigger memories. This can be a real aid to dementia and recall memories of happy times pottering in the garden. Being outside in the sunshine and fresh air promotes vitamin D. Being at one with nature is great for lifting the spirits and the well being of our residents. We have a wonderful garden at West Eaton and a special sensory garden designed to stimulate the senses. It is lovely to be out enjoying the garden now spring has arrived. Gardening gives increased confidence and self esteem. There is a great sense of achievement in completing a tangible project that gives stunning results. 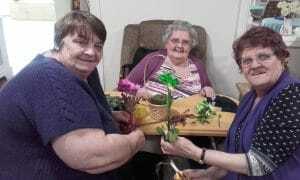 It is lovely to see our residents showing families and friends their handiwork. They are, quite rightly, very proud of their delicious vegetables and beautiful blooms we have through the summer and autumn. 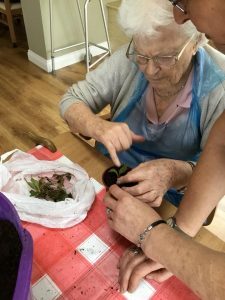 Working together and the social interaction of gardening is also beneficial to our residents. A time to chat about a shared interest or the project in hand. 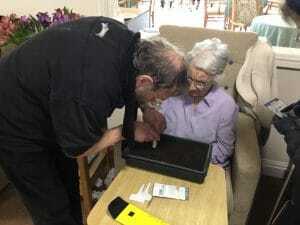 A sense of team work is a real morale boost and sparks conversations and forges friendships between our residents. It also helps alleviate feelings of loneliness and isolation. Gardening has been scientifically shown to ease anxiety and depression. There has even been found to be friendly bacteria in the soil which work the same way as antidepressants. It was still cold and wintry outside, even with some snow on the ground, but we were keen to get ready for the spring! Angie brought lots of seeds to pot out. Our residents planted beetroot, tomatoes, night scented stocks, sweetpeas, dianthus and snap dragons. It was a very productive and rewarding session. Lovely to share tea and cake afterwards as well and admire our handiwork! It was great to welcome back Angie for our second session. This time we potted tomatoes and rose campions, which Derry and Pauline particularly enjoyed. 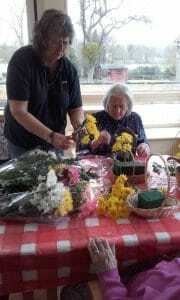 Our residents’ families also helped with flower arranging, making Easter baskets for our dining room. Joyce had her daughters Sue and Eileen visiting and they shared a special family time. You can see from the big smile on Joyce’s face how delighted she was to have her girls with her. Comments like this are so wonderful to read. Thank you! And thank you to Angie from Hereford Growing Point. We are looking forward to our next gardening therapy session.